I'm on a bit of a Marvel roll at the moment and I recently got to see Black Panther too! I loved it, obviously. Mostly, I loved Okoye! If you don't know who she is then let me tell you a teeny bit about her. She is the General of the Dora Milaje and the head of the Wakanda armed forces. She and the Dora Milaje are are an elite group of kickass women and how can you not think they are awesome? 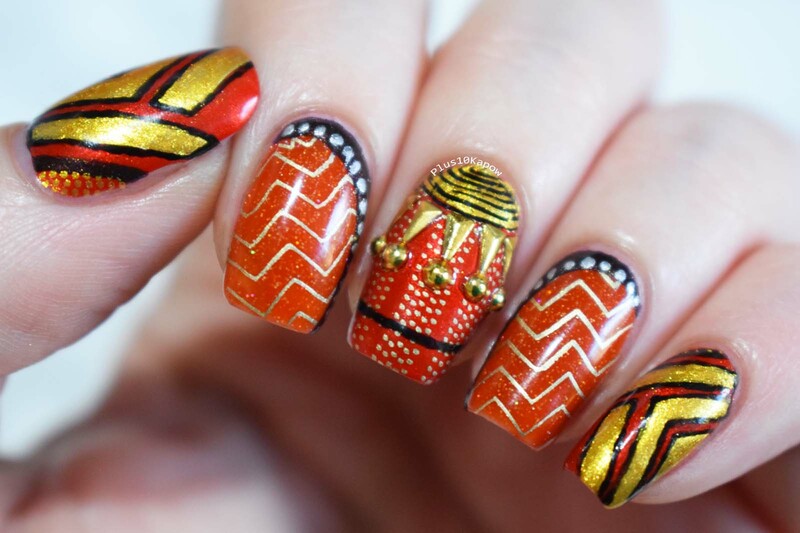 Okoye's armour inspired me to sketch up some nail art and this is it. It didn't turn out perfect and I really wish I had done my thumb and pinkie better, maybe made the lines thinner and the overall pattern smaller. Plus, I put the triangle studs on my middle finger upside down. BUT, I really love this mani, it was pretty fun to wear and had a bit of sparkle to it and I am really loving coming up with and doing some fun and nerdy nail art again, despite my tremors. The Gold triangles studs and the round flatback studs are both from the same Born Pretty Store stud wheel. I have got some more nerdy nail art planned and hopefully I can execute them but is there any that you'd like to see me try?